Biopic Films (or biographical pictures) are a sub-genre of the larger drama and epic film genres, and although they reached a hey-day of popularity in the 1930s, they are still prominent to this day. 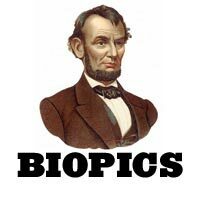 'Biopics' is a term derived from the combination of the words "biography" and "pictures." These films depict and dramatize the life of an important historical personage (or group) from the past or present era. Sometimes, historical biopics stretch the truth and tell a life story with varying degrees of accuracy. Big-screen biopics cross many genre types, since these films might showcase a western outlaw; a criminal; a musical composer; a religious figure or leader of a movement; a war-time military hero; an entertainer; an artist; an inventor, scientist, or doctor; a politician or President; a sports hero or celebrity; or an adventurer. In many cases, these films put an emphasis on the larger events (wartime, political or social conditions) surrounding the person's entire life as they rise to fame and glory. Some begin with the person's childhood, but others concentrate on adult achievements. Biopics have existed since the earliest days of silent cinema in films such as French filmmaker Georges Melies' feature-length epic Jeanne D'Arc (1899) (and Cecil B. DeMille's Joan the Woman (1916) with opera star Geraldine Farrar), D.W. Griffith's religious epic Judith of Bethulia (1914), Abel Gance's innovative six-hour-long epic Napoleon (1927), and director Lloyd Ingraham's Jesse James (1927) with Fred Thomson as the western outlaw. According to some sources (although not confirmed), the most represented historical character on the screen is French emperor Napoleon Bonaparte. Others that are very often represented include: US President Abraham Lincoln, Jesus Christ, Vladymir Ilich Lenin, Adolf Hitler, Cleopatra, Queen Victoria, Henry VIII, and Queen Elizabeth I. Western characters often portrayed include William Frederick "Buffalo Bill" Cody, William Bonney ("Billy the Kid"), Jesse James, Wild Bill Hickock, General George A. Custer, and Wyatt Earp. Various actors and actresses have won Academy Award acting Oscars for their tour-de-force biopic performances, such as James Cagney as George M. Cohan in Yankee Doodle Dandy (1942), George C. Scott as the cantakerous WWII General Patton in the widely-acclaimed Patton (1970), Katharine Hepburn as King Henry II's Queen Eleanor of Aquitaine in The Lion in Winter (1968), Sissy Spacek as legendary country singer Loretta Lynn in Coal Miner's Daughter (1980), Daniel Day-Lewis as Irish cerebral palsy victim Christy Brown in My Left Foot (1989), and Ben Kingsley as the charismatic, pacifist, 20th century Indian spiritual leader Mahatma in Sir Richard Attenborough's Gandhi (1982). Earlier, Muni was featured as an Al Capone-like gangster in Scarface: The Shame of a Nation (1932), and in seven different roles in Seven Faces (1929) including Chopin's teacher Joseph Elsner, Napoleon and Franz Schubert. Later, he portrayed French explorer Pierre Radisson in Hudson's Bay (1941). Other examples of historical characters in biographies in the 1930-40s included Norman Taurog's children's dramatic film Young Tom Edison (1940) about the famed inventor (Mickey Rooney), The Story of Alexander Graham Bell (1939), the historical drama Marie Antoinette (1938) about the famous Austrian princess who married future King Louis XVI, Michael Curtiz' costume drama The Private Lives of Elizabeth and Essex (1939), and Mervyn LeRoy's oft-nominated Madame Curie (1943) with Greer Garson as the title character researching radioactivity with her husband Pierre (Walter Pidgeon). Although the film traces the career of a fictional newspaper tycoon (patterned after William Randolph Hearst), Citizen Kane (1941) can be considered a life-story 'biopic.' Artists and literary authors have also inspired biographical film epics, such as two films from Vincente Minnelli. His film Madame Bovary (1949) starred James Mason as Gustave Flaubert on whose classic novel the film was based, and another film, Lust for Life (1956) featured Kirk Douglas as tormented Dutch painter Vincent Van Gogh. Billy Wilder's The Spirit of St. Louis (1957) dramatized the historical figure of 27-year old Charles Lindbergh (James Stewart), the "Lone Eagle." (See the dramas genre and sports films sub-genre for biopics such as Knute Rockne, All-American (1940) and The Pride of the Yankees (1942)). Dustin Hoffman starred as tormented comedian Lenny Bruce in Lenny (1974), and Rod Steiger played the title role of Chicago's famous mobster in Al Capone (1959). Attenborough's reverential Chaplin (1992) chronicled the life story of silent comedian and film-maker Charlie Chaplin (Robert Downey, Jr.), as did part of Peter Bogdanovich's The Cat's Meow (2001). And Tim Burton's zany Ed Wood (1994) was about the maverick, low-budget, Hollywood director (Johnny Depp) of cult films who often is regarded as the 'worst director' of all time. Milos Forman's Man on the Moon (1999) starred comic Jim Carrey as Andy Kaufman, a quirky and eccentric comedian. Paul Schrader's cautionary Auto Focus (2002) was the quasi-biopic of the double-life of Hogan's Heroes sitcom star Bob Crane (Greg Kinnear), who engaged in various sexcapades due to his newfound fame.